As a professional calligrapher, I spend a lot of time thinking about calligraphy and handwriting. I’ve come up with a handful of tips for how anyone (not just artists!) can transform their handwriting. Read more about this post on the craftsy blog here. When you write a note for your family on the fridge, do they later ask you to decifer it for them? At the grocery store, do you find yourself puzzling over what you jotted down for yourself? 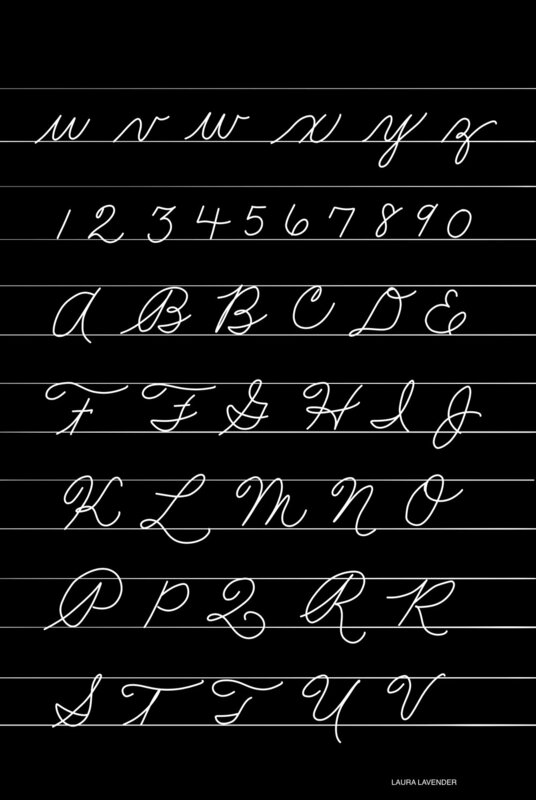 Would you like to make your everyday handwriting more beautiful? or forget beautiful - how about just more legible! Your are not alone! Many people - perhaps even most people these days - find their own handwriting difficult to read. In our technical age, pen & paper has fallen so far by the wayside that beautiful everyday handwriting has become nearly obsolete. As a professional calligrapher, I’ve spent a lot of time thinking about handwriting, and here are my top ideas for how anyone can improve their everyday writing! 1. WRITE SLOWER! Writing slower is the easiest way to improve your handwriting immediately. When one writes slower, more attention can be paid to the actual shapes of the letters being created, instead of just the content. 2. USE LINES! Having your writing clearly sitting on a line improves the clarity. 3. POSTURE AND POSITION Have you noticed that in historical movies, when the characters are writing lovely pen & ink letters, they are seated at a desk with an inkwell nearby (not writing on a scrap of paper against the door of the horse drawn carriage!) Posture is key to improving your handwriting. Sit down comfortably to write, feet on the floor and back straight. Do not curl over your writing but stay upright. Keep your writing in front of your chest, not to the left or right of your body. 4. USE NICE MATERIALS Bring out your lovely paper and your favourite pen…. and watch your writing improve! Using nice materials will automatically make your more attentive to the shapes your are creating. Write with your beautiful fountain pen every day! 5. Spacing Keep enough space between the lines of your writing to avoid the ascenders & descenders (that is, the tail of the g or the loop of the f) colliding. This will greatly improve legibility. Another rule of thumb - or pen!- when writing is to keep the equivalent of a small letter 'n' in between each of your words or numbers. 6. Hold your pen gently! Don't strangle your pen. Enough said.